Garry and Margaret are in love but have to meet on the sly because her father forbids Garry seeing her. 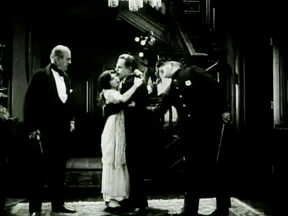 Selfridge sends Margaret away for a long time. When she returns with a baby, he is furious. "You shameless girl . . . you!" Tearfully, Margaret tells him, "Garry and I married for love. I have no reason to be ashamed." When Garry sneaks in one night to see his wife and baby, Selfridge has him arrested for burglary and sent to prison. Three and a half years later, Peggy has grown into a beautiful, precocious child. 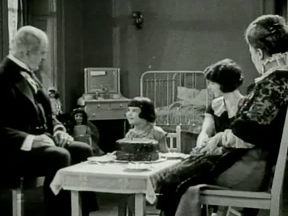 While her mother has not been well since Garry was taken away, Peggy has been kept inside with a nurse and unable to play with other children. 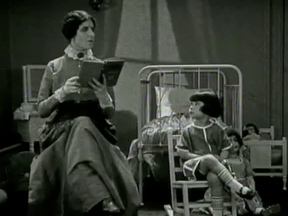 The nurse expects her to sit still and listen while she reads Elinor Glyn's "Three Weeks." Peggy slips away from the nurse, and the butler and cook let her hide out in the kitchen. When the nurse comes in, she hides in the flour bin but makes sure she takes the bowl of chocolate frosting with her. As they celebrate Peggy's birthday in her room, she sets an extra place. Selfridge asks her, "Are you expecting someone else?" 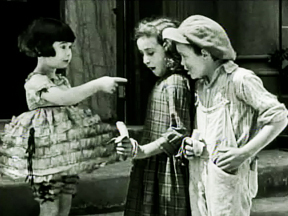 and to Selfridge's surprise, Peggy says, "Mother said my Daddy might come." Peggy sneaks out to be with some of the neighborhood kids. She would like to have one of their bananas and offers to trade her dress to the other little girl for one. Peggy is lost and has a stomachache from eating too many bananas. 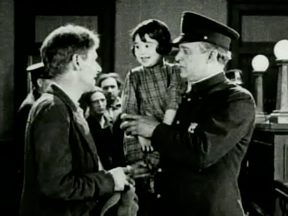 Garry, just out of prison after three and a half years and destitute, finds her and takes her to the police station so she can be returned to her parents. He has no idea this is his daughter, and she doesn't know this is her father. Garry is convinced by a man he was with in prison to do one more safe robbery to get them started now that they are released. Not realizing whose home he's invading, he goes into Selfridge's Westchester home where Peggy and Margaret are also staying. Peggy walks in on him as he's robbing the safe. Selfridge comes in late and surprises Garry. 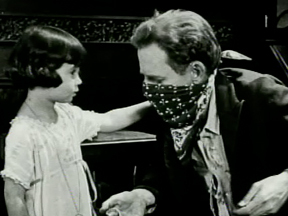 Thinking he's just any other burglar, Selfridge shoots him - while Peggy watches. Margaret rushes down the stairs and realizes this is her husband she hasn't seen for almost four years.